A while ago, whilst dressing my dog to go to “grandma’s” and putting together her travel bag (which includes wee wee pads, treats, toys, food and walking supplies) I put a note down in my “blog topic ideas” list to write about how our pets have evolved in status to become legitimate family members. I see it especially prevalent in suburban areas as well as among empty nesters, single women and of course, the gays / lesbians. Pretty much wherever you have humans who are inclined to be nurturers but don’t have children in their lives, their pets tend to become kindred. And you even see situations where people are on their own and impoverished but they still have pets as companions / life partners…like the odd homeless folks you see on the street with dogs at their side. My dog, which came to me via my wife, might as well have been pushed right out of her womb…because she is absolutely her baby and there is absolutely nothing she wouldn’t do for our Ava. As a matter of fact, Ava owns more shirts than I do, visits the doctor (vet) and the hairdresser (a.k.a. “groomer) more often than I do and in fairness probably gets more walks and bathes more often than I do. But I digress. My point is that, as humans evolve from agrarian economy-based cultures, animals become more near and dear to us. The further they get removed from our obvious connection in the food and labor chain, the more we empathize and connect with them. Dogs and cats as pets in particular seem to be the strongest example and the luckiest species on the planet, in my estimation anyway. 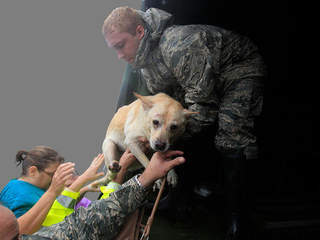 I was inspired to write this today while half-watching CNN (a habit i should probably switch-up) as I work and hearing stories of the hurricaine resuces in Louisiana – mostly people with dogs. Apparently, after Hurricaine Katrina they conducted a survey to understand more about barriers to evacuation for those citizens who ended up getting stuck. The number one answer: people didn’t want to leave their pets. Have a crate or pet taxi. Take a printout of the animal’s rabies and vaccination records. Hotels that accept pets require these documents. Be sure to pack enough food, water, and medication for each pet to survive seven days on. The American Humane Society of the Unites States advises this in emergency situations. Use pet tranquilizers or mood stabilizers if needed. Animals are sensitive to extreme change. Hurricanes and other natural disasters interfere with their normal routine and threaten their sense of security. Take toys, treats, beds, cleanup supplies, and other comfort items the pet is familiar with. This will help keep them calm in a stressful situation. Have a pet disaster kit in the car. This will include cleanup supplies such as litter and scoop for a cat’s litter box and plastic bags for dogs. Avoid leaving pets at the animal shelter. Workers are overwhelmed taking in rescue animals. I think it’s an interesting conundrum of our modern times. But I also love that as societies evolve, we start making our circle of family bigger to include animals. It gives this anthropologist hope that we are mindful of our bigger connections…and that our relationship with other species and the planet really are a central factor in what makes us truly human. Next ›Crimes of Hilarity: What Makes Criminal Behavior A Big Joke? The International Whistlers Convention is held on the campus of Louisburg College. Not overflowing but not empty either (and still my kids complain “there’s nothing to eat around here. With a little sand, rocks, cement and the right containers, you can make your own.